Here’s a delicious recipe that’s perfect for your next family dinner or dinner party. These shrimp are easy to make in the oven and the dip is also flavorful and a great accompaniment! Preheat oven to 450 degrees. Place 2 rimmed baking sheets in oven to heat. Stir together lemon zest, garlic, celery seeds, paprika, cayenne, 2 teaspoons salt, the honey, and oil in a large bowl. Add shrimp, and toss to coat well. Place shrimp in a single layer on hot pans. Roast, without flipping, until browned on bottoms and opaque throughout, about 5 minutes.Meanwhile, make the dip: Stir together lemon juice, sour cream, celery leaves, and 1/4 teaspoon salt. 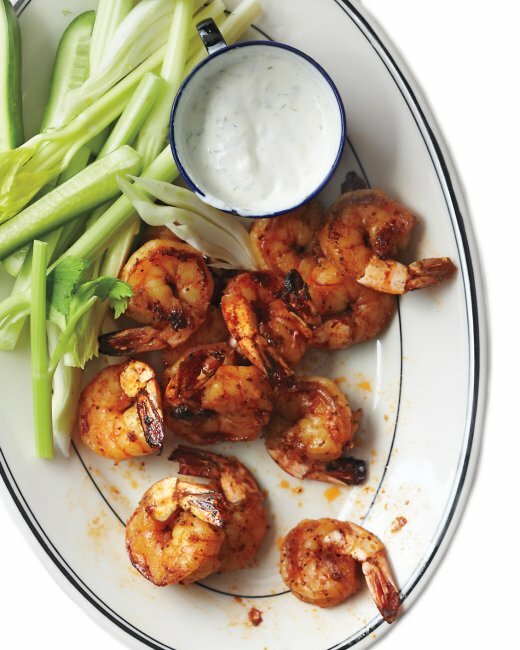 Serve with cooked shrimp. Recipe courtesy http://imbornto.com/featured.html, original recipe by Martha Stewart Living Omnimedia ©2014 Martha Stewart Living Omnimedia, Inc. All rights reserved.